Dynamic Engineering is an Australian owned and operated company dedicated to fume and dust extraction and general industrial ventilation equipment. We specialise in adverse environment applications, including offshore facilities, hazardous zone and process ventilation. We also offer at-source, general fume extraction and dust collection systems. Our key staff have many years’ experience in contracting, project management, commissioning and consulting and therefore clients can be assured of practical fit for purpose recommendations. We can also offer design advice to couple equipment together to suit client applications, as well as providing installation and commissioning services if required. Our company stands by our quality Australian and international products, and we are the exclusive distributors of several products throughout Australasia, including New Zealand. We offer Australian-made industrial and heavy-duty centrifugal fans, including high-pressure, materials handling, trim and chopper, and high-temperature equipment. We offer a full range of standard axial and general building service / heating, ventilation and air-conditioning (HVAC) products from local and international suppliers. We continually review our range to ensure we are offering the best value for money products. These include inline axial fans, plate-mounted fans, in-line mixed flow and centrifugal fans, roof and wall mounted fan units. Many can be supplied with the full range of motor requirements and ancillaries needed. We provide effective, efficient and economical at-source extraction systems, manufactured in Sweden. The aim is to extract fume at source, which reduces the total air movement required dramatically compared to large fixed hoods and extraction systems. This allows the operator to focus on the job at hand without worrying about dangerous fumes or dust. At-source extraction offers the benefits of reduced noise, and operating costs, as well as fewer stray fumes. Fume extraction units are offered in a wide variety of lengths and configurations. Filtered portable and wall mounted units fit in any workshop layout, and are suitable for hazardous areas and specialised environments. 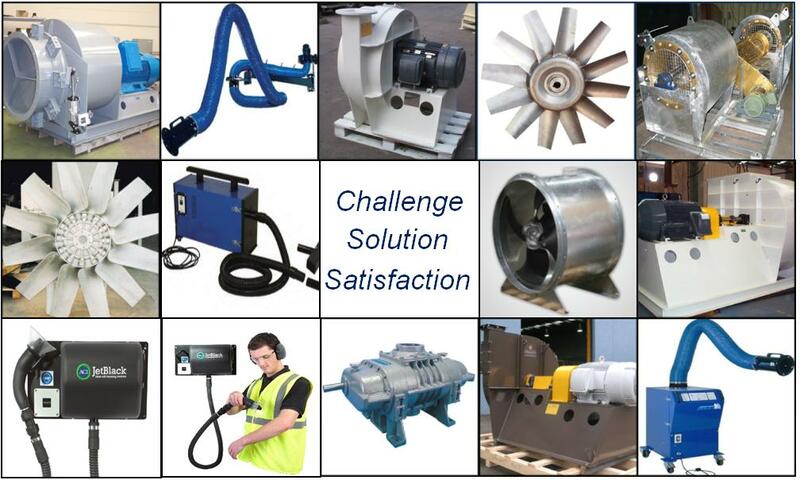 We also offer a variety of dust collection equipment and services, customised and selected to suit client requirements. We have qualified local experts, in conjunction with international support from our suppliers, so can supply and install a solution to most mist, fume or dust collection challenges. We offer a number of high-tech, highly efficient and long-lasting filter media, available to suit most applications. From small shaker collectors to bespoke cartridge collectors, our company can offer the right collection equipment, extraction hood and ductwork design, and the most suitable extraction equipment to create an efficient, cost-effective package. We also ensure you have all the information and expertise required to maintain your system. We are the exclusive provider of the UK-manufactured JetBlack cleaning unit and isolation booth, which is a safe solution for the cleaning and de-dusting of personnel and equipment using multi-stage blower technology. The success of this unit is proof that improper use of compressed air for personal blow-down cleaning is a serious issue for employers. Available in a portable or wall-mounted package, the unit has been specifically designed to be installed into a factory or clean room environment where dust, dirt, fibres or water need to be removed from personnel clothing and footwear, or from products during the manufacturing process. If more effective contaminant collection is required, then we also offer the Personnel Cleaning Booth. We are able to offer one of the broadest lines of competitively priced positive displacement blower models and vacuum boosters in the industry. These units all comply with stringent quality standards. Each blower and booster is tested before shipping and carries a factory warranty. All units are manufactured within stringent ISO 9000 quality assurance standards. Typical applications include pneumatic conveying, chemical processing, gas moving, vacuum boosters or exhausting, food processing, waste treatment aeration, elevated pressures, and complete package systems.